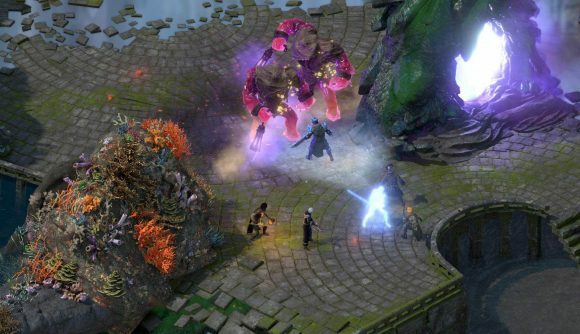 Following Beast of Winter, Pillars of Eternity 2’s next DLC is Seeker, Slayer, Survivor, a completely different type of adventure that places players into a gladiatorial arena fighting for the glory of Galawain, god of the hunt. The Seeker Survivor Slayer DLC was shown off at Gamescom 2018, and we were able to discuss the ideas behind it with the expansion’s director, Brandon Adler. The DLC’s title is drawn from the three forms of fights that you’ll conduct within the arena: seeker, survivor, and slayer matches. Survivor fights are, as the same suggests, about staying alive through a series of enemy waves. Slayer fights are tough in a different way: “they’re big hard creatures that kill you quickly and you have to kind of smash and grab,” Adler explains. These artefacts are sacrificed within the arena in order to summon each suite of fights, and so the exploration elements are just as vital to the experiences as the arena fights themselves.